The landscape of academic publishing has seen a discernible increase in new publishing initiatives entering the sector over the last few years. These new publishing initiatives have a potentially disruptive effect on the scholarly communication environment, providing new avenues for the dissemination of research outputs and acting as pathfinders for the evolution of academic publishing and the scholarly record. In 2016 we commissioned a research project focused on institutional publishing initiatives which includes academic-led publishing ventures (ALPs) as well as new university presses and library-led initiatives (NUPs). We are pleased to announce the publication of the report ‘Changing Publishing Ecologies. A Landscape Study of New University Presses and Academic-led Publishing’, which charts the outcomes of this research. The report, by Dr Janneke Adema (Coventry University) and Graham Stone (Jisc, formerly Collections and Scholarly Communications Librarian, University of Huddersfield), benchmarks the development of NUPs and ALPs and fills in knowledge gaps. It complements our previous research, such as OAPEN-UK, the National Monographs strategy, the Jisc/OAPEN Investigating OA monograph services project and the new Knowledge Exchange Landscape Study on Open Access Monographs which will be published in September 2017. The NUP and ALP strands of the research study were co-ordinated and run in tandem by Stone and Adema. This study was informed by a desk top review of current library publishing ventures in the US, Europe and Australia and an overview of international academic-led initiatives and their existing and future directions. The NUP strand consisted of a survey, which collected 43 responses, where the ALP strand was informed by interviews with 14 scholar-led presses. Taking different approaches for these two types of press, the report captures the take-up, reasoning and characteristics of these initiatives, as well as their future plans. The report concludes with a series of recommendations to help support and foster new developments in this space, share best practice, collaboration and the tools and services to facilitate further innovation. As such the report recommends to support community building for both NUPs and ALPs, the establishment of guidelines for setting up a press, the provision of legal advice and guidelines for preservation and dissemination, and the development of future projects to support these new initiatives. In particular, the community professed a need for the development of a toolkit that would aid both existing NUPs and academic-led presses, as well as those universities and academics that are thinking about setting up their own publishing initiatives. This toolkit, based on information collated from the communities, could consist of how-to-manuals, best practices guidelines, standardised contracts and agreements and alternative FLOSS software able to support the production process. 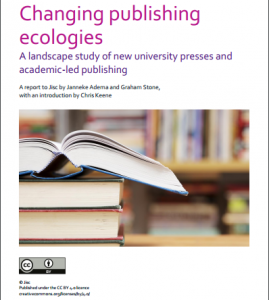 The findings of the research carried out as part of this report provide an evidence base for future support for both new university presses and academic-led publishing initiatives to help create and maintain a diverse publishing ecology. We plan to work with both communities, its members, and partners to further build on these recommendations and seek suitable ways to take these ideas forward to realisation. Posted by Verena Weigert on July 6, 2017 in general, publishing platform. Updates from the Jisc Library & Scholarly Futures team at Jisc.